This year we decided to decorate to the theme of the 1975 film Jaws. Bruce is our replica of the shark built for the film. The makers of the film named their shark Bruce and we kept the name, at first because we wanted our shark to be as menacing and lifelike as in the movie. 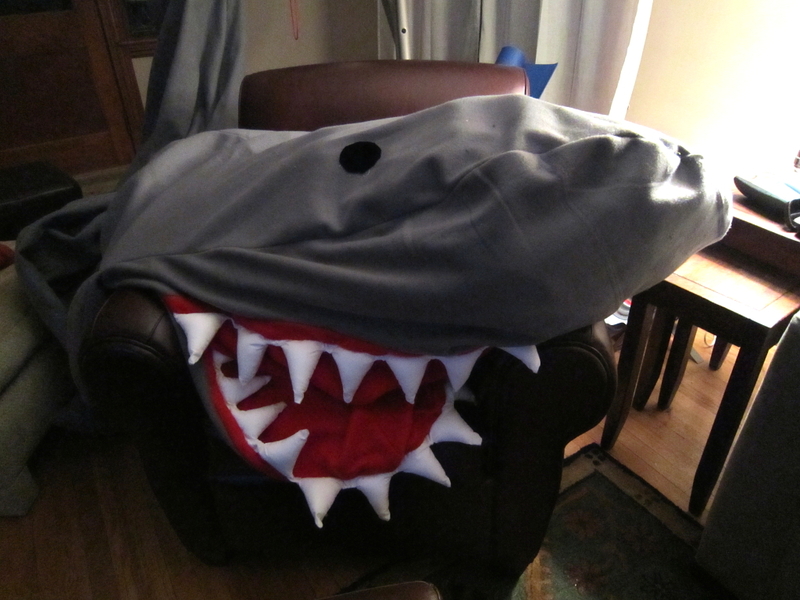 Later our shark proved to be as unreliable as the movie prop; thus, piling on to the naming convention. Our Bruce is made of fleece – known to be the most menacing of fabrics – and has an internal pneumatic movement system that would scare most industrial engineers. Of course, we’ve already pointed out that Bruce didn’t work, so most of his guts were removed and replaced with Winnie-the-Pooh-like stuffing. Mechanical problems hampered the filming of the movie Jaws and forced the filmmakers to go in a different direction that may have improved the film. Likewise, our Bruce’s inability to swim caused us to change course and concentrate on the periphery of the set. The “set” in this case being our front yard. The focus became a talking skeleton that we first used in 2006. This year we upgraded it to playback a different spiel each time someone approached him. And so he was re-christened “Quint”, the character played by Robert Shaw in the movie. We ripped the entire DVD and broke out all of Quint’s monologues. 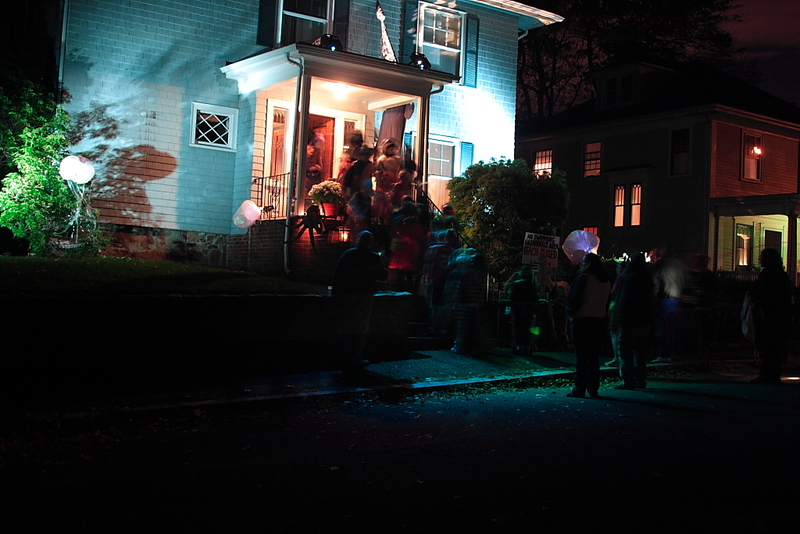 To fill out the environment, we added some octopi, helium filled jellyfish, and projections of various other sea life. There was some discussion about how far we could blur the line between reality and artistic license. For example, does it make sense to have fish swimming on the house? We projected a rippling water effect on to the sidewalk further twisting the physical nature of the environment, but it didn’t matter. Little kids look past the laws of physics. Must be video games or something. In the end we were really happy with the result. With 230 kids at the door it was really worth the effort. 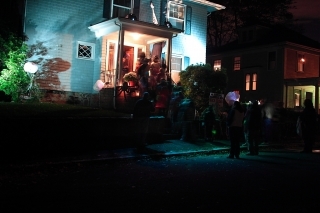 We were even happier when a trick-or-treat’er commented that he liked the theme and, more importantly, that he noticed that we have a different theme every year. That was really gratifying. Of course, he suggested that next years’ theme be torture related. Posted in Halloween on November 11, 2010 by Doug.